I’ve been loving tassels lately. When I picked up a plain white table runner from Ikea, I knew that I wanted to jazz it up and tassels immediately came to mind! I tried my hand at making my own tassels out of embroidery thread and it was super easy. Now my table runner is super colorful and ready for summer! Step 1: Wrap your thread around the cardboard. You can do as much or as little as you want. The tassel will be twice as thick as the thread at this point, so just keep that in mind. Step 2: Slide the looped thread off of the cardboard. Step 3: Wrap a 6 inch piece of thread around the center of the loop and tie. Step 4: Cut through the looped ends. Step 5: Fold the ends over so that the tied piece of thread is at the top. Step 6: Take another piece of 12 inch thread and wrap around the head of the tassel a few times and then tie it off. Step 7: Trim off and uneven ends. 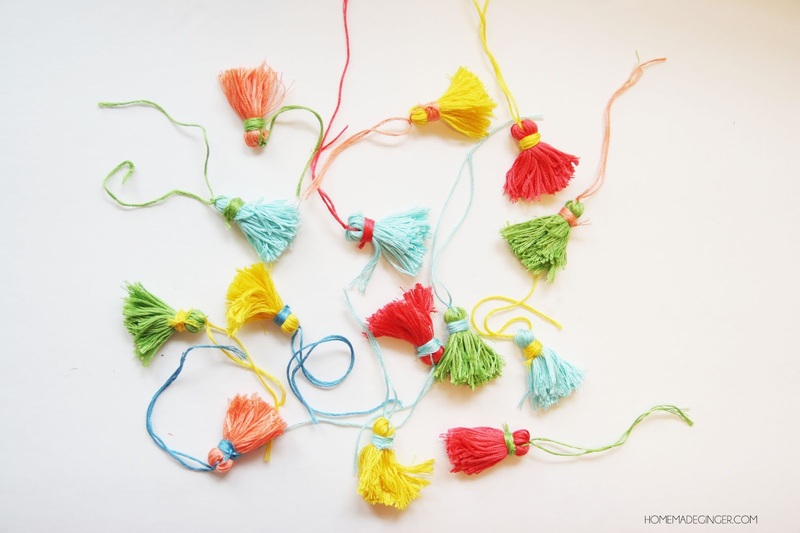 Now that you have your bunch of tassels, it’s time to attach them to a table runner! Step 1: Using an upholstery needle, thread the embroidery thread through it. Step 2: Poke your needle through the end of the runner. Step 3: Push it up and through the 2 pieces of thread on the opposite side. Tie it around itself to secure. Step 4: Stitch a line with the sewing machine through the loops on the table runner to make sure it really stays put! I’m excited to show you more of the table that this runner is sitting on. It’s our newest furniture DIY just in time for summer! Yes that sounds great! THanks!